There are many different types of stainless steel; each has its own unique composition and qualities. Depending on the chemical composition of the steel, it may be harder, stronger, easier to work with, magnetic or not. Different steels have different price points as well. 201 stainless steel is an alloy that contains half the nickel and increased manganese and nitrogen of more popular steels. While it is less expensive than some other alloys (because of its low nickel content), it is not as easy to work or form. Type 201 is an austenitic metal because it is a non-magnetic stainless steel that contains high levels of chromium and nickel and low levels of carbon. 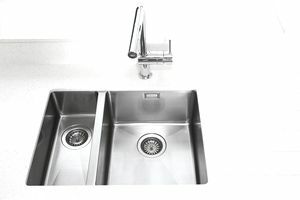 Type 201 stainless steel is a mid-range product with a variety of useful qualities. While it is ideal for certain uses, it is not a good choice for structures that may be prone to corrosive forces such as salt water. Type 201 is part of the 200 series of austenitic stainless steels. Originally developed to conserve nickel, this family of stainless steels is characterized by low-nickel content. Type 201 can substitute for type 301 in many applications, but is less corrosion resistant than its counterpart, particularly in chemical environments. Annealed, it is non-magnetic but can become magnetic by cold working. A greater nitrogen content in type 201 provides higher yield strength and toughness than type 301 steel, especially at low temperatures. Type 201 is not hardened by heat treatment and is annealed at 1850-1950°F (1010-1066°C), followed by water quenching or rapid air cooling. Type 201 stainless cannot be hardened by heat treatment, but can by cold working. Type 201 can be annealed at temperatures between 1010 and 1093°C (1850 and 2000°F). In order to keep carbides in solution and avoid sensitization, rapid cooling through the carbide precipitation range 815 and 426°C (1500 and 800°F) is required. This grade of stainless can be both formed and drawn. Intermediate annealing may be required for severe operations as a result of type 201's high work-hardening rate. Type 201 stainless can be welded by all standard methods used for 18 percent chromium and 8 percent nickel stainless steels, however, inter-granular corrosion can impact the heat zone if carbon content exceeds 0.03 percent.